Hostilities on the border of the disputed Nagorno-Karabakh region with Azerbaijan flared up overnight, with reports of gun and mortar fire, as well as casualties on both sides. Azeri and Armenian Defense Ministries accused each other of provoking the escalation. 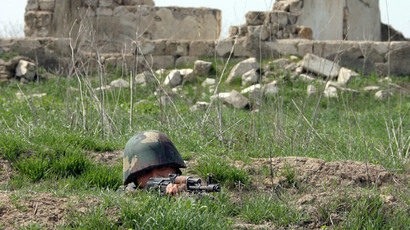 Azerbaijan said Armenian troops opened fire 127 times over 24 hours along the border. They were using mortars and heavy machine guns, the statement released on Saturday morning said. Armenia said Azeri troops went on the offensive overnight and were using tanks, artillery and military aircraft. 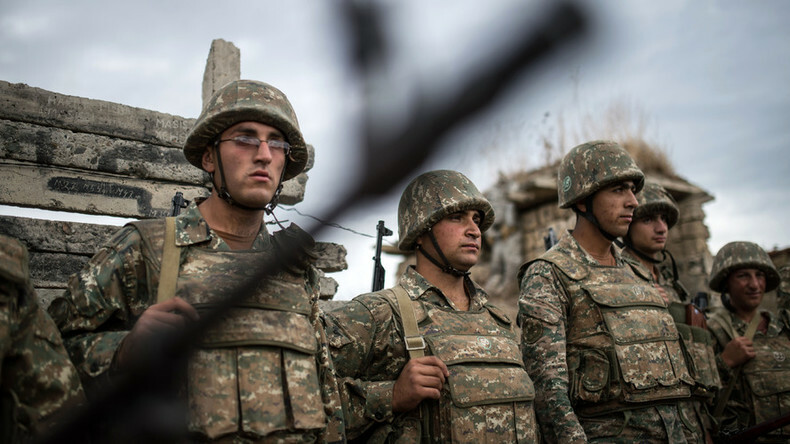 Eighteen Armenian soldiers were killed and 35 injured in the fighting with Azerbaijani forces on Saturday, Armenian President Serzh Sargsyan said. “Since the restoration of the truce in 1994, it’s the most large-scale warfare, which Azerbaijan has tried to carry out,” Sargsyan said at the National Security Council meeting. Yerevan distinguishes its own armed forces from those of the breakaway republic, while Baku considers them all Armenian. Militias in the unrecognized republic of Nagorno-Karabakh, the focal point of the conflict, claimed they shot down two Azeri helicopter gunboats and two drones, and destroyed at least two tanks. Azerbaijan confirmed losing one helicopter and one tank as well as 12 soldiers. Baku said it took under its control several strategic points on the border, from which villages on the Azeri side could be threatened by Armenian forces. The sites are currently being fortified by the military, Azerbaijan’s Defense Ministry said. “The Armenian Defense Ministry officially states that information distributed by Azeri media that Azerbaijani armed forces allegedly captured several settlements on the territory of the Nagorno-Karabakh region and that losses of the Armenian side amount to dozens in military hardware and hundreds in manpower is blatant disinformation,” the ministry said in a statement. Nagorno-Karabakh authorities said two teenage students were seriously injured near their school by rocket fire from Azerbaijan. Separate reports in the local media said six civilians and three soldiers were taken to hospital with injuries received during the clashes. The two countries accused each other of triggering the escalation. “The responsibility for the situation is fully on Armenia, the aggressor and occupier nation,” the Azeri Foreign Ministry said in a statement. Armenia said it condemned the actions of the “Azerbaijan military along the engagement line with Nagorno-Karabakh and the border with Armenia.” Both accused their rival of targeting civilians in Azerbaijan and Nagorny-Karabakh respectively. Reports from Nagorno-Karabakh say Azerbaijan sent a recon unit across the border overnight. It was intercepted by local forces, said Dmitry Pisarenko, who heads the Armenian branch of the Russian news agency Sputnik. A firefight ensued and rapidly escalated into a major battle, involving tanks, helicopters and artillery, he said. “Nagorno-Karabakh forces say they have downed two Azeri helicopters and two drones,” he added. With Azerbaijan and Armenia apportioning blame to one another, it’s impossible to establish which party initiated the hostilities, Aziz Aliev, head of the Sputnik Azeri news agency, told RT. “Even people who are there can't tell which side is behind the provocation, because the official bodies deny they were the first to start firing,” Aliev said. “It's very complicated because Azerbaijan says the conflict started after Armenia shelled its territory and vice versa, so we are waiting for more information to come in,” he added. Russian President Vladimir Putin has called on all sides in the conflict to immediately cease hostilities, said Kremlin spokesman Dmitry Peskov. The Russian Foreign Ministry said Moscow was in contact with other members of the OSCE Minsk group, which is tasked with monitoring the Nagorno-Karabakh truce, and was closely watching the development of the situation. The group is currently co-chaired by Russia, the US and France and also includes Belarus, Germany, Italy, Sweden, Finland, Turkey and the two conflicting countries. The group co-chairs released a statement after a meeting to express their concern with the scale of hostilities and call on the parties involved to avoid further violence. The group said it regretted the loss of lives, including civilians, caused by the clashes. Concern over the escalation was also voiced by EU Foreign Policy Chief Federica Mogherini, who called on all sides to show restraint and observe the truce. She said the EU supported the mediation effort by the OSCE Minsk group. Russian Defense Minister Sergey Shoigu held emergency phone talks with his Armenian and Azeri counterparts to discuss how the situation can be defused, the ministry said in a statement. The two former Soviet republics are locked in a decades-long conflict over Nagorno-Karabakh, a predominantly Armenian mountainous region that was part of the Azerbaijani SSR, but broke away in 1988. The region declared independence in 1991, with a bloody three-year war ensuing. Russia brokered a ceasefire between Armenia and Azerbaijan in 1994, but the tensions have never actually stopped since then, and there is occasional violence. The mutual distrust between Armenia and Azerbaijan is rooted in a long history of ethnic and religious conflicts in the region as well as their participation in the rivalry of regional heavyweights – the Turks, the Russians and the Persians over the centuries. Both nations had their first bid for statehood in the wake of the collapse of the Russian Empire in the early 20th century. Among other things their independence resulted in a war in 1918. When Moscow reinstated its control over the region for the USSR, the conflict was swept under the rug, but never fully extinguished.